REQUIRED EQUIPE SF UNIFORM - Order and Pay for your Uniforms Online! 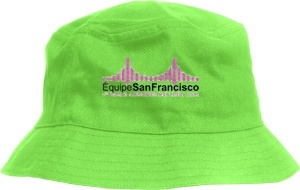 An Equipe SF Uniform (Jacket and Hat) will be required to march with the team during Opening Ceremonies at the Olympic Stadium on Saturday, July 29, 2006. The total cost, including processing fees, is $80.00. Uniforms must be ordered and paid for online (see "Add to Cart" items below). Cash and checks are not being accepted for security purposes (yours and ours!). The DEADLINE to order and pay is WEDNESDAY, MARCH 1st. Our manufacturer requires 16 weeks for production and delivery, so no uniform orders can be made after the deadline. There will be no additional production runs of our uniform. You will need to provide your own plain black training pants/shorts (preferably without any design or stripes) and white t-shirt. Optional custom designed EquipeSF white t-shirts are available for purchase. On the next webpage, additional jackets, hats, t-shirts, and pins can be ordered, but not in lieu of the uniform. The trading of team uniforms and pins with other athletes/artists is a long-standing tradition during big international events such as the Outgames and Olympics, so think about ordering some extras. You'll be glad you did once you get to Montreal! Because of our unique standing in the world community, anything "San Francisco" carries a premium in trade value, so stock up now. There will be over 100 different countries and 14,000 athletes/artists to trade with! Nota Bene: Pricing of the Uniforms and Jackets assume a minimum team order of 75 units. If for some reason we do not get at least 75 orders, you will have the option of purchasing your uniform for the additional unit cost (most likely less than $10.00) or getting a refund on your payment, less the Pay Pal processing fee. Select Jacket and Hat Size @ $77.38 per uniform plus $2.62 Pay Pal processing fees. (Click on picture for sizing chart.) Jackets are made from an extremely lightweight and breathable microfibre, and have one zippered pocket in the back. Hats are made from a cotton/poly twill with metal eyelets. Remember, you will need to provide your own white t-shirt and black training pants or shorts (preferably without any design or stripes to maintain uniformity). Optional white Equipe SF T-shirts are available for purchase on the next webpage.